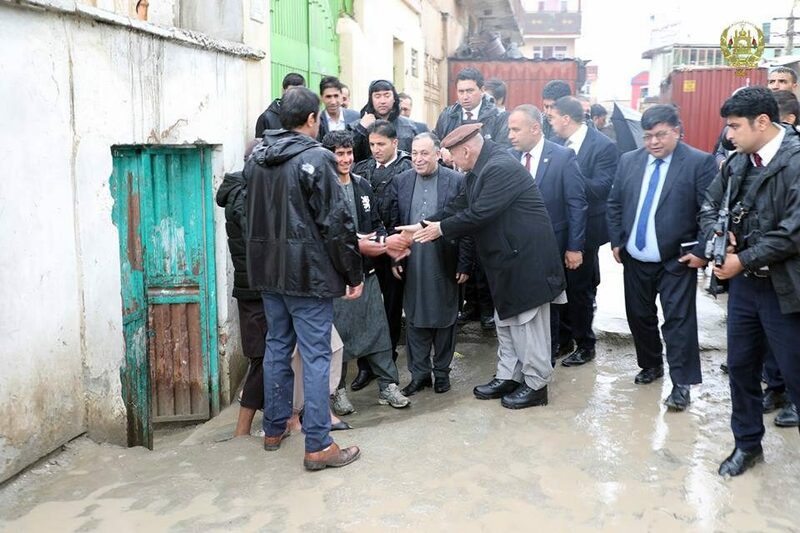 KABUL: President Mohammad Ashraf Ghani visited Kabul’s flood-hit areas on Tuesday, his office said in a statement. The president visited Kabul’s 5th PD, Qala-e-Wahid where he spoke with affected people and got informed about their condition, according to the statement. Representing 5th and 6th districts’ residents, Eng. Shah Mahmoud and Eng. Haneef while thanking the president said many houses were threatened by floods, asking for urgent assistances in this regard, the statement added. The related areas’ residents also asked president to pay heed in construction of sideways, alleys, watercourses and blocking floods’ itineraries. After hearing the residents, the president said preparations would be taken to block the floods’ ways, adding the surrounding areas of Kabul River would be cleared of usurpation, because, the river’s territory belongs to the nation. He instructed Capital Region Authority and Kabul Municipality to launch an urgent survey and also ordered Kabul governor to prepare the list of affected people at its earliest so urgent aids to be provided for them.